Summary: Twelve Steps to a Compassionate Life corresponds to the TED Prize that Karen Armstrong received in 2008. The Prize consists of a cash award plus the assistance of the TED community in granting a wish of the recipient. I watched and sketchnoted the talk where Karen Armstrong declared her wish. 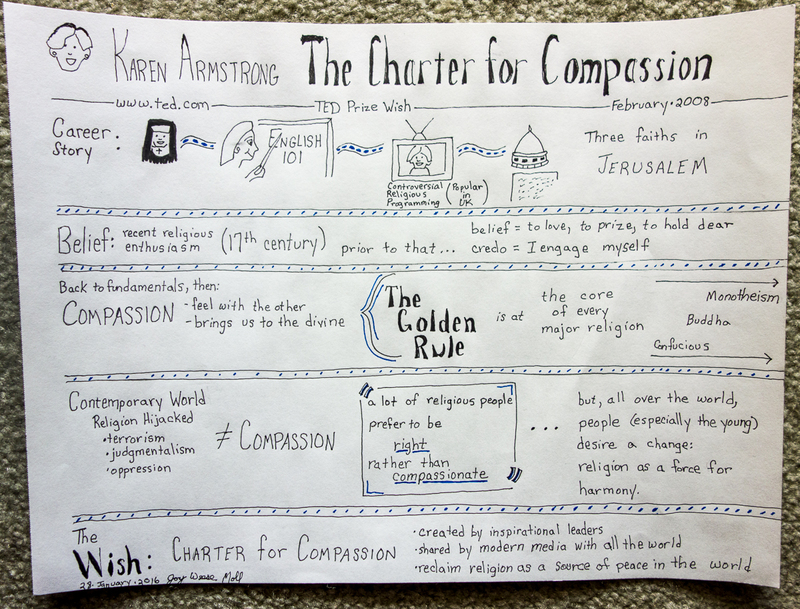 Notes taken from Karen Armstrong’s TED Prize talk: The Charter for Compassion, delivered in February 2008. I encourage you to watch the talk for yourself because it’s also a great introduction to the book. Her wish, a Charter for Compassion, came true and continues to function. My plan, then, is to work through one of the Twelve Steps each month for the next year. In the spirit of Learn in Public, I’ll be taking this on as a blog project called Compassionate Sunday. Every Sunday for the next year, I’ll examine my progress on the step I’ve assigned myself for that month. Who? Me and anyone who wants to play along. You can join in a big way by doing the whole thing with me – 12 months for 12 steps, 52 weeks of Compassionate Sundays. Or, in smaller ways by piping up with a blog post or comment whenever you have something to share on the current topic. February. The First Step: Learn about Compassion. April. The Third Step: Compassion for Yourself. May. The Fourth Step: Empathy. June. The Fifth Step: Mindfulness. July. The Sixth Step: Action. August. The Seventh Step: How Little We Know. September. The Eight Step: How Should We Speak to One Another? October. The Ninth Step: Concern for Everybody. November: The Tenth Step: Knowledge. December: The Eleventh Step: Recognition. January: The Twelfth Step. Love Your Enemies. Where? On my blog and yours and anywhere else that you like to share thoughts and things that you’ve learned. When? Every Sunday from February 7, 2016 through January, 2017. Appeal: Twelve Steps to a Compassionate Life by Karen Armstrong will appeal to anyone who is troubled by the combative climate in the world and wants to experience internal movement toward peace with an external impact toward harmony. Reviews: I see from Bonnie’s Books that I wasn’t the first to have this idea. The Book Buddies made a year-long study of Twelve Steps to a Compassionate Life their project for 2014. I’m attaching a link list in case you want to write a blog post announcing your intention to participate in Compassionate Sunday. Such posts are the most efficient way to spread the word in the book blogging community — thank you! I’m going to have to think about this…if not doing on Sundays, doing some other time, or at least joining with you in spirit. I already have committed to keeping track of my one word with Sunday posts and don’t really like doing two posts per day…BUT I’ll think about this, that’s for sure. AND I’ll promote it on social media so others can join if they can. Thanks, Bryan! You could do it on any day and link up the next Sunday. That would work!